Is 2019 The Year Of The Telehealth Tipping Point? Deciding how close we are to the tipping point means deciding how to measure it. I see four factors pushing the strategic impact of telehealth in the field and pushing us closer to that tipping point. 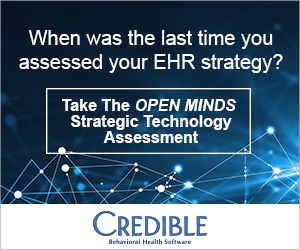 Greater adoption of telehealth by health plans—Recent research shows that 96% of all health plans use telemental health services, including 41% of all health plans that use eCBT, 21% that use an online engagement tool, and 16% that use consumer-facing portals. And 50% of Medicaid health plans have adopted these technologies (see Trends In Behavioral Health: A Reference Guide On The U.S. Behavioral Health Financing & Delivery System). Employer health plans are also seeing big adoption rates, as 96% are expected to make telehealth available in states where it is allowed, including behavioral health services (56%) (see Employer Health Plans Pushing Telehealth Adoption One Step Closer To ‘Ubiquity’). Changes in policy from the Centers for Medicare & Medicaid Services (CMS)—In October, CMS issued a proposed rule to give Medicare Advantage plans in 2020 more flexibility to offer telehealth benefits to all members and improve coordination for dual eligible beneficiaries. While Medicare would continue geographic restrictions on telehealth in the fee-for-service program, Medicare Advantage plans would be able to offer telehealth benefits to all enrollees, not only those in rural areas (see Medicare Proposes Additional Telehealth Benefits For Medicare Advantage Plans). Expansion of telehealth services at the U.S. Department of Veterans Affairs (VA)—We have seen major moves to expand access to telehealth for veterans with the passage of the Veterans E-Health and Telemedicine Support Act of 2017 and new policies from the Veteran’s Administration (VA) (see VA Finalizes Telehealth Rule Allowing Health Care Professionals To Practice Across State Lines; Senate Passes VETS Act, Enhancing Telehealth Access for Veterans and House Passes Bill Expanding VA Telehealth Across State Lines). Additionally the Department of Defense (DoD) also released updates to TRICARE coverage, requiring telehealth to be covered in the same way it covers in-person visits (see Major Changes Coming To DoD’s TRICARE System Jan. 1). And on March 6, 2018, the VA announced it launched a pilot telehealth program to provide rural veterans with post-traumatic stress disorder (PTSD) remote access to psychotherapy and related services (see VA Launches Pilot Telemedicine Program For Rural Veterans With PTSD).